Great promise for the new edition, the gameplay received beautiful settings after dividing opinion among fans last year. The game is now faster, more agile and easy to control athletes. The kicks are also less exaggerated, and athletes move intelligently, creating more scoring opportunities. Casual gaming with friends, simulation games, online competitions or management mode. Whatever your taste, PES 2016 has ideal game modes for you, through the MyClub Master League and complex to simple friendly or custom championships. PES 2016 will be available on both the good old Xbox 360 and PlayStation 3 as in modern Xbox One and PS4 or PC. The best part is that the differences between each version is minimal, valuing the acquisition at any platform. 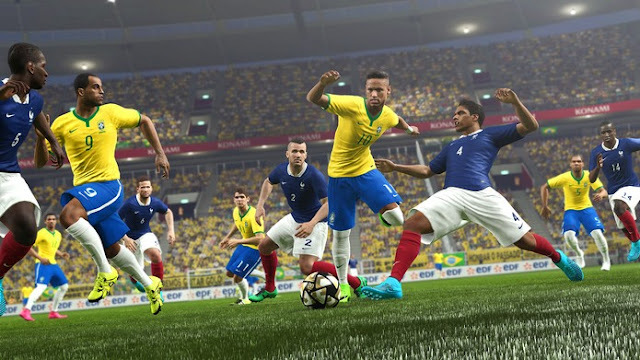 After the incredible PES 2015, the franchise has received even more beautiful graphics. Be the textures used on grass, detailing the fabric of the shirts of the players, the most well-designed hair or facial expressions and animations, PES 2016 has taken a remarkable step in the visual aspect from the previous version. For the first time in the history of the football game, the title has abandoned the traditional pre-configured celebrations. From now on, after scoring a goal, you can control the player and select different celebrations, which can be combined. Fans of the South American and European football also gain a full plate with the official and exclusive presence of major tournaments such as the UEFA Champions League, Europa League and the Libertadores Champions League.